We have again had the pleasure of visiting Grenaa HTX for a day. Our purpose with the visit was to tell the students about the science at home project, and about the latest developments of the game. We opened with a very short presentation of our in-development game “Quantum dream”, and asking the students to play it for a short while. Of course, we are eager to show of “Quantum dream”, but it is also always a little scary to show your game to others: What if they hate it? Luckily, it seemed that people did not hate Quantum dream, but rather quite enjoyed it. 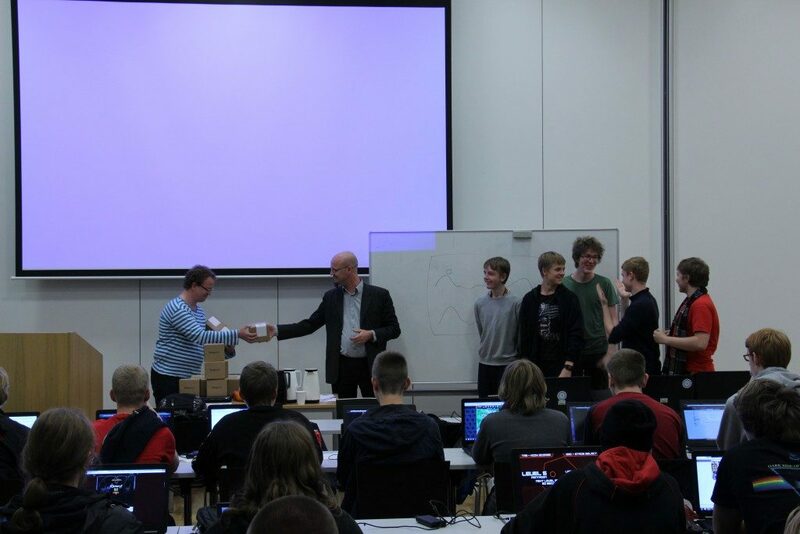 Our purpose with this, was for the students to think about ways of improving the game, and this was the right audience for it: As students at Grenaa HTX, they are attending the only Danish Game IT college, and as such are aspiring game developers themselves. After the play session, Our own Mads Kock entertained the students with a talk about the quantum computer, and the theory and science behind it. In particular, Mads explains that we’ve built this game in order to recruit the help of the public in building a quantum computer. Mathias Skov then gave a presentation about the upcoming “Learn” part of our website. “Learn” is intended as an online experimentarium, and we wanted to show a few of the installations we have planned for “Learn”. As with the game, we also wanted the feedback and design ideas the students could give us. After a nice lunch, the students worked in groups, brainstorming and kicking ideas for improvements of our games and learning experiments around. This ended out in some interesting and useful ideas that the students presented for us. There were quite a lot of interesting ideas: Some of them, we have now worked into our designs, others we have kept for reference, as valuable feedback to help us guide design decisions. In the end, we named a winner in the category “Best improvement suggestion for Quantum Dream” and another for “Best improvement suggestion for Learn”. Of course, the talented students behind these suggestions should have a reward! We hope we will have the opportunity to come back to Grenaa HTX for another visit in the next year!